I suppose I had known about Poulenc for quite some time as a young singer, but it wasn’t until I discovered a brilliant early cycle of his called Chansons Gaillardes that I really fell in love with his music. They’re delightfully filthy in a way that some children’s movies are, filled with double entendres that would sail over certain heads and leave others with a bad case of the church giggles. Dirty text aside, the music itself is lush with exciting rhythms and juicy late-romantic harmonies, wonderfully French and lively. It was when I decided that I wanted to learn more of this fantastic composer’s repertoire and started thinking about how I could incorporate him into themed recitals and concerts that I really started delving into the music of other members of the group of his contemporaries called Les Six. This group of incredibly diverse musicians were conveniently lumped together as emerging composers more because of their proximity to each other than their similarities as musical innovators, though their early works all seem written as a deliberate departure from the German model of the massively overblown world of post-Wagnerian romanticism. Poulenc remains the most song-oriented of the group, with Milhaud as the nearest contender for that title, though he and Honegger are more famous for their orchestral output. Auric was responsible for some absolutely beautiful film scores, to include Cocteau’s La Belle et la Bete. Durey seemed to be more of a political activist than a composer, though some of his chamber works are really stunning. Tailleferre, the only female member of the group, was also one of the most prolific, and one of the most decorated, winning several prizes for her piano and ensemble works as a young woman and writing almost right up to her death (she outlived all of the five men of the group, though she survived Auric by only a few months). I slowly pieced enough information about them to develop a major love affair with their music as a whole, so it is exciting to be able to program their music and play to their strengths. If you want to hear some real jewels of their output, be sure to check out hexaCollective’s concert on Saturday, January 14th at Mount Vernon Music Space (1015 N. Charles Street in Baltimore). To find out more about the ensemble, check them out at hexacollective.com. I think there is a massive amount of amazing music from this portion of the 20th century that’s really worth singing, and though some of it is tough to find, it’s definitely worth the effort. If you’re interested in this unique concert of solo and chamber music for voice, flute, oboe, English horn, clarinet, bassoon, and piano you may purchase tickets online: http://hexasix.eventbee.com/. $12 Adults *Use online discount code “hexaFan”! 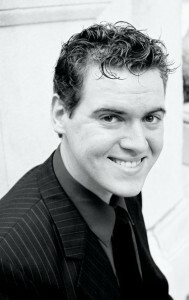 Andrew Sauvageau, baritone, loves singing everything he is allowed to sing in song, oratorio, opera and other genres, and occasionally singing the things he’s not allowed to sing to himself. On stage, he has taken on the roles of Falke in Die Fledermaus, the Forester in Cunning Little Vixen, Papageno in Die Zauberflöte, Herr Bauer in the modern opera Dora, and Count Almaviva in Le Nozze di Figaro. As a concert soloist, he sang Bach’s Magnificat and Mozart’s C Minor Mass under Helmuth Rilling as a young fellow in Oregon. In the Greater Baltimore/Washington area, he’s tackled solos in Bach’s Johannes-Passion, Mendelssohn’s Elijah, Brahms’ Ein Deutsches Requiem and Handel’s Messiah. As a recitalist, his major love affair with Romantic Lieder and 20th and 21st Century song has led him to perform a variety of concerts, to include the premieres of several new works by American composers.